Quetta: The electoral fight for NA-272 Lasbela-Gwadar is arguably the toughest electoral battle in Balochistan in upcoming elections. On 25th July, three heavyweights will fight tooth and nail to represent Gwadar-Lasbela in the parliament of Pakistan. These three big guns are Sardar Akhtar Mengal President of Balochistan National Party (BNP) and former Chief Minister of Balochistan, Jam Kamal the President of Balochistan Awami Party (BAP) and former State Minister for Petroleum and Natural Resources and Aslam Bhootani the former speaker of the Balochistan Assembly. The most important aspect of this election is that the winner will represent Gwadar in the National Assembly which is a crucial responsibility given Gwadar’s significance for CPEC. NA-272 is one of the largest constituencies in Balochistan. Starting from Bela in North to Hub in South and Jiwani in East, NA-272 is stretched over 800 KMs and makes up one-third area of Khyber Pakhtunkhwa province. This constituency has 356,879 voters which are divided between three provincial assembly constituencies. PB-50 is the stronghold of Jam Kamal, Bhootani family has won PB-49 in last 9 consecutive elections and PB-51 is currently the stronghold of BNP. Therefore, the competition is very strong and very hard to predict a winner. Among all three of the candidates, Aslam Bhootani is unique. Unlike Jam Kamal and Akhtar Mengal, Bhootani is not an undisputed head of a large tribe and he is also not the president of a large political party in Balochistan. Still, Bhootani is praised for turning his hometown of Dureji into a small model village. He is also known for his fierce opposition to CPEC energy generation projects in Hub which are detrimental to the natural environment. In a candid interview with The News, Aslam Bhootani vowed to fight vehemently for the rights of people of Gwadar and Lasbela if elected. He said Gwadar lacks basic facilities like drinking water and electricity and the government claims to make it a commercial hub. “I am not against development,” he clarified, “however, not a single caravan will pass from Gwadar to Kashghar if people of Gwadar are not provided their basic rights,” he warned. But, Bhootani is not only the one making rounds of Gwadar. The vote of Gwadar will be crucial in deciding the outcome of the elections and therefore all the three candidates are focusing on the voters of the port city. Both Jam Kamal and Akhtar Mengal have visited Gwadar numerous times to address the political gatherings and party meetings. In fact, last month when Akhtar Mengal and Jam Kamal traded allegations on the twitter, its root cause was their standoff in NA-272 elections. 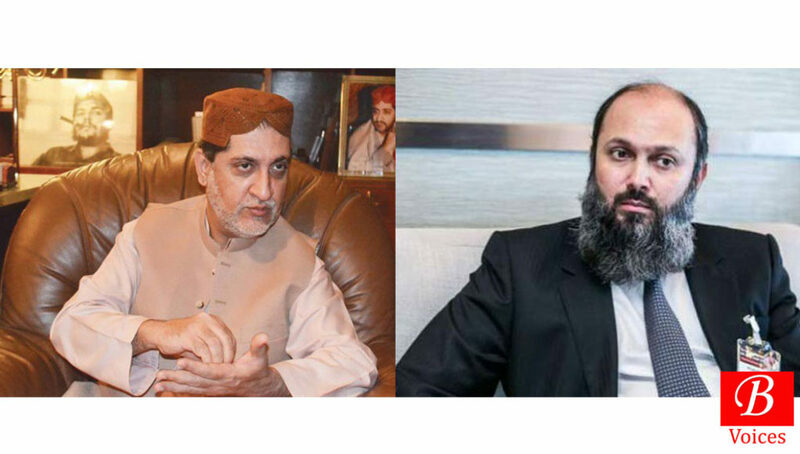 Stakes are too high in this elections for both Mengal and Jam and hence they are channelizing their energies to score a victory on the strategically important seat of NA-272. In these elections, the National Party has announced to support Bhootani. The detailed analysis of election results of PB-49, PB-50, and PB-51 from 2002 to 2013 by The News proves that Bhootani-National Party duo has a lead over the other candidates. Jam Kamal comes second with a very narrow margin. The BNP has not got many votes from this constituency historically, however they can still put up a fight if they get votes of the PPP with whom they have forged an alliance. Moreover, the voter turnout of the three individual constituencies in NA-272 will also matter. Historically the voter turnout of the Jam dominated PB-50 has always been high and the voter turnout in Gwadar has been low. If the same trend continued then it will clearly benefit Jam Kamal in the elections. Shahzada Zulfiqar, a senior journalist who has covered elections in Balochistan since 1988, believes that NA-272 will witness a tough triangular competition in the forthcoming elections. “This constituency stretches over 800 km and it’s very hard for candidates to cover each and every area which makes the election tougher for them,” he claimed. Zulfiqar believes that these elections will also be having symbolic value as leaders of BAP and BNP are contesting against one another. “It will be a huge setback for BAP if Jam Kamal lost the election in NA-272 and the party might not be able to recover from the demoralizing effect of this loss,” he commented. NA-272 also highlights the unique dynamics of elections in Balochistan. From PB-49, a provincial constituency which falls under NA-272, Sardar Saleh Bhootani, elder brother of Aslam Bhootani is contesting elections on the ticket of BAP. So, the supporters of Bhootani family in PB-49 will vote for BAP on provincial assembly and will vote against BAP’s candidate Jam Kamal and for Aslam Bhootani on National Assembly. This paradox explains the political dynamics of Balochistan where individuals are stronger than political parties. Shahid Rind, a senior broadcast journalist who is from Lasbela, also foresees a nail-biting contest on NA-272. “It’s very hard to predict the winner at this stage but I can say that the difference between votes of winner and runners-up will not be more than few thousands,” He told The News. Rind explained that in this election Jam Kamal will be relying on his stature as Jam of Lasbela, Aslam Bhootani on the supporters of his constituency and their goodwill and Akhtar Mengal will be relying on his party vote bank in Gwadar and support from the PPP. Explaining how he can win the elections, Bhootani said he expects a large lead from PB-49 and a sizable number of votes from PB-51 Gwadar as well. “My development vision and failure of BNP in Gwadar and Jam Kamal in Lasbela during the last five years will pave the way for my victory,” said an optimistic Bhootani. A government official who had served in Lasbela district and not authorized to speak to media said on condition of anonymity that Jam Kamal has the clear advantage over other two competitors. He said Bhootani and Mengal do not stand a chance against Jam who enjoys support in entire Lasbela. “The larger vote banks share of Lasbela and high turnout will prove to be decisive factors in the victory of Jam Kamal,” contended the official. Just like the rest of the country, allegations of arm twisting by the unidentified persons can also be heard in this constituency. Bhootani alleged, “certain quarters want to elect a puppet from NA-272 so their designs to sell out Gwadar can be successfully implemented but I will not let that happen.” He also claimed that his supporters are being called by powers that be and asked to withdraw their support for him in the elections. The News, however, cannot independently verify the claims of Bhootani. Elections in NA-272 hold paramount importance for entire Balochistan given the high level of stakes involving Gwadar and CPEC. Clearly, Gwadar has not benefitted from CPEC so far and the energy and water crisis are evidence of this claim. Therefore, NA-272 can’t afford a controversial election marred by claims of rigging and arm twisting. The Election Commission of Pakistan must ensure the transparent conduct of elections on NA-272. Whoever is victorious must be prepared for the fight that he has to put on for people of Gwadar and Lasbela in next Assembly. This story was originally published in The News International.